The new species, Galeamopus pabsti, is the most recent dinosaur to be described by paleontologists from the Department of Earth Sciences of the University of Turin, Italy; the Faculty of Science and Technology, Universidade Nova de Lisboa, and the Museum of Lourinhã in Portugal. 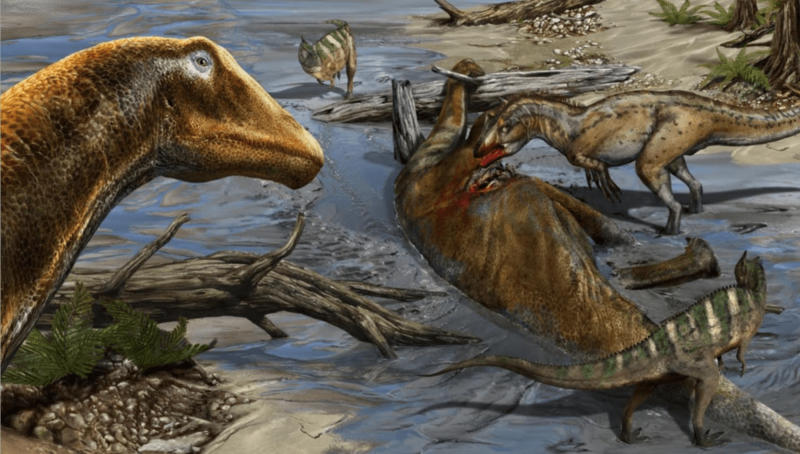 This Jurassic dinosaur was originally excavated in 1995 by a Swiss team, led by Hans-Jakob “Kirby” Siber and Ben Pabst, in Wyoming, in the United States and is the latest in a series of new discoveries by the paleontologists Emanuel Tschopp and Octávio Mateus, which started in 2012 with Kaatedocus siberi. The paper describing the new species was published online in the open access scientific journal PeerJ on Tuesday, May 2. Galeamopus pabsti is similar to the famous dinosaur Diplodocus, but with more massive legs, and a particularly high and triangular neck close to the head. It is the second species of the genus Galeamopus to be shown to be different to Diplodocus by the same researchers (the first being published in 2015, in a paper which also reinstated the brontosaurus as a distinct genus). The new species is dedicated to Ben Pabst, who found the skeleton, and prepared it for mounting at the Sauriermuseum Aathal in Switzerland, where it is one of the main attractions of the permanent exhibit. Diplodocid sauropods are among the most iconic dinosaurs. With their greatly elongated necks and tails, they represent the typical body shape of sauropods. Species of this group occur also in Africa, South America, and Europe, but the highest diversity is known from the USA: more than 15 species of these gigantic animals are known from there, also including the famous Brontosaurus. Researchers are still baffled by this high diversity of giants, and are continuing their studies to understand how such a diversity could be maintained by the ecosystem in which they lived.